Have any of you planted super-sweet sugar maples? Apparently, a scientist went around and tested the sugar levels in the sap of a lot of maples, gathered seeds from the sweetest individuals, tested the sap of those seedlings, then cloned the ones that showed the most potential. Unfortunately, Forest Keeling is the only definitive source I've found for the super-sweet sugar maples, and they don't sell to individuals online (although you can drop by their garden center if you live in Missouri). On the internet, the Improved Sugar Maples at Garden Delights may or may not be the same type of sugar maple, and there are also supposedly high-sugar Silver Maples available from St. Lawrence Nurseries (although the price tag for the latter gave me a bit of a shock). I'm leaning more and more toward just planting locally-adapted seedlings out of my own woods after checking out those prices, but Dave Marshall's comment about tapping silver maples did make me wonder whether these wet-loving, fast-growing maples might be a better choice for our farm. Of course, if we're going in that direction, maybe we should just tap our ubiquitous box elder. Has anyone tried syrup-making from these less-popular maple species? I know you'd have to cook the sap down further and be more careful not to collect buddy sap, but what I'd really like to know is --- what did you think of the flavor? I guess we really should just tap a box elder and see for ourselves! Hi Anna- saw this interesting reference on box elder syrup- http://milesawayfarm.wordpress.com/2011/03/15/not-eastern-syrup-pt-2/#more-672 Looks like less end product, but fine taste- he's got great notes on how to boil it down. St. Lawarance Nurseries carries the SS Sugar Maple. www.sln.potsdam.ny.us The website is good for contact info and maybe catalog requests. Orders are placed by mail. I thought silver maples were no good for syrup because they had an off taste. Certainly the sap from them smells different. Just a note about St. Lawarance Nurseries - this is the last year the current owners are operating it. There are no buyers for it yet so it will not be available to people to order from for an indefinite time period. So if you are interested in purchasing their maple trees I would do so this year (Orders must be postmarked by April 1st). Last year my sister got some boxelder syrup from her neighbors, and we got to try it while we were home visiting. It was pretty fantastic on pancakes, but less sweet than traditional maple syrup. My sister said she doesn't like it as a sugar replacement in coffee because it's not as sweet, but the flavor is great for most other syrup applications. I made syrup from my large, suburban silver maple yard tree a couple of years ago. It was delicious, though my understanding is that the syrup yield is lower per volume of sap as the sugar content of the sap is lower than that of sugar maple. 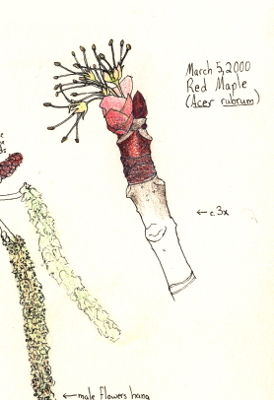 The book The Sugarmakers Companion has lots of information on using other species for syrup, and includes box elder.